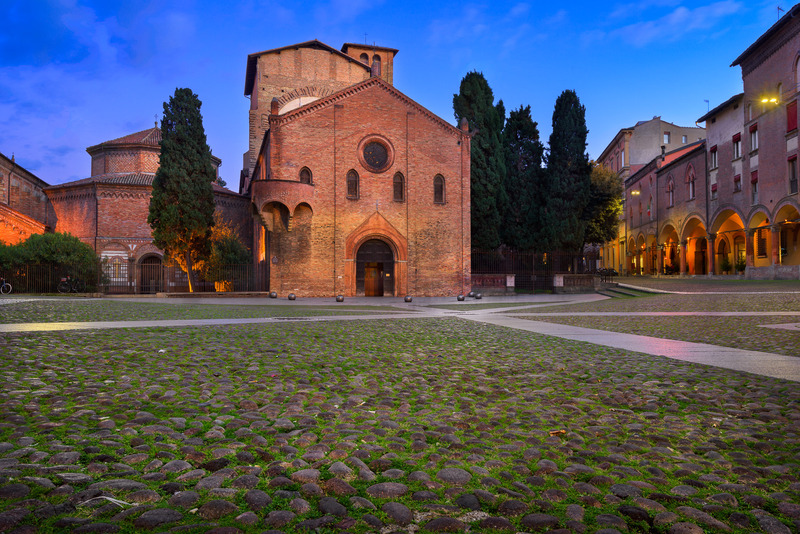 Beyond the city’s towers, I entered Bologna’s winding medieval streets. Following one of these winding streets, I came to the Piazza Santo Stefano, an unusual little piazza that isn’t a piazza at all, merely a gradual widening of the street. December 2016, single image, additional exposures for highlights, focal length 26mm, aperture f/11, shutter speed 15 seconds, ISO 64, tripod. It’s an unusual and picturesque part of Bologna. The piazza is not, properly speaking, a square: the Via Santo Stefano gradually widens into an odd bit of geometry that is the piazza. The area has been known for centuries as ‘le Sette Chiese,’ or the Seven Churches, in honor of the imposing structures surrounding the piazza. Nowadays, there aren’t seven churches; there are four: the Church of the Crucifix, the Holy Sepulchre, San Vitale and Agricola. The churches were built and remodeled at different times, and over the years, they came to be connected, almost as if they are growing out of one another. The result is a labyrinth that begins with the entrance to the Church of the Crucifix, the largest of the four. The faithful — or the merely curious — could spend hours wandering from one ecclesiastical wonder to the next. I wanted to photograph the piazza, but because of its place as one of the most historic (and popular) places in the city, it was almost always full of visitors. I waited until evening, when I hoped to have it mostly to myself. As I set up my tripod on the piazza’s ancient cobblestones, my mind wandered to the generations of faithful who have walked those stones. I captured the historic piazza in the low light of evening, thinking of faith and its mysteries. This entry was posted in City and tagged Bologna, Italy.